It was 5am on a Saturday morning when my trip to Kundapur was confirmed. Without further delay I logged into the KSRTC website and searched for the buses available. A direct bus to Kundapur was available at 8:30am however I was in a hurry and taking that service was not going to suffice my need. Hence I decided to take the 6am Mangalore Airavat as this would reach Mangalore by 13:00hrs and I could catch a connecting bus to Kundapur. Though the booking time for the 6am Airavat bus was closed, I was sure that there would be ample amount of seats available on this bus. 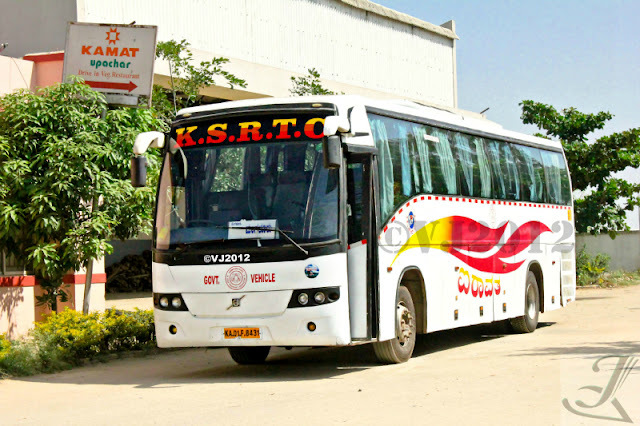 My friend dropped me to the bus stand and as I soon as I entered the Mangalore platform, I saw dozen buses comprising of Volvo B7R's, a couple of Club Class buses, Rajahamsa buses all heading to Mangalore. I saw the 6am Airavat ready for departure and just as I walked towards it the driver cranked its engine. The bus was an old B7R which belonged to Mangalore division and its body built by Azad. I boarded the bus and saw the bus 60% full, not bad for a Saturday morning service. The conductor was courteously welcoming the passengers inside the bus and was assisting them with their luggage. I took my seat towards the rear of the bus and after 10mins the bus began to move slowly making its way out of the busy KBS bus stand. A 500ml water bottle was given. As far as the interiors of the bus was concerned, it was top notch. The bus had undergone refurbishment however the biggest boon according to me was there was no TV inside the bus which meant I could sleep peacefully without any disturbance. The bus made its way towards Navrang and we picked up a couple more passengers and headed out towards Yeswanthpur. The bus took the Yeshwanthpur-Nelamangala toll way and the moment the bus entered toll way, the driver flexed his muscle reaching top speeds upto 102kmph. Since I had hardly slept the previous I decided to give my eyes a much required break. Wondering why I took a cue from an ad...? Read on...!!! The bus was driven very smoothly on the highway which is under construction. The driver was showing his skills in handling the bus and so were the motorists on the highway showing their 'skills' on the highway. As the bus was approaching near Hirsave, the driver rammed the brakes hard to avoid hitting a motorist who came on to the highway from the service road without indicators. The incident ensured everyone in the bus who were fast asleep woke up sliding off their seats. The bus then made its way towards Channarayapattana and stopped infront of the police station for a routine parcel pick up. The bus was stopped for 15mins and then finally we headed towards Kamat Upachar. Here the bus stopped for a good 25mins. We started again and we reached Hassan by 9:30am. After picking up few passengers we headed towards Sakleshpur and this is where our driver dodges another accident. The incident happened just before Sakleshpur bus stand when an auto infront of us stopped without any indications. Our bus driver turned the bus towards the oncoming lane and went straight infront of another Airavat coming from Mangalore. Both the buses managed to squeeze past each other without any incidents. 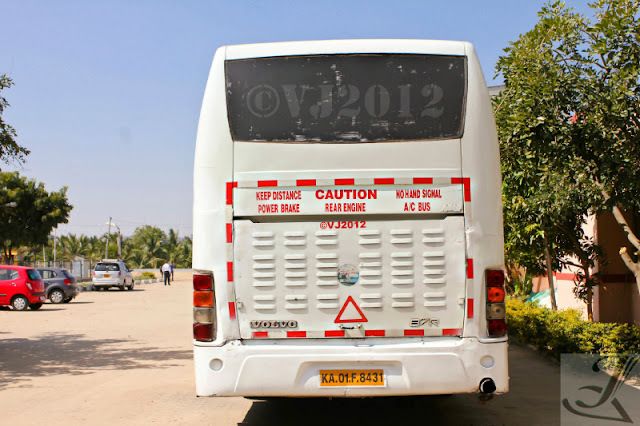 The bus then entered the notorious Shiradi Ghats which is known to punish any form of vehicle. At Hassan I switched my seats and took a front row seat to enjoy the view of mother nature in all her glory and ofcourse she did not disappoint me. The roads which were smooth in beginning gave away and soon our bus went off roading. The driver was carefully driving the bus ensuring the body of the bus didn't take a beating. The bus slowly made its way out of the bad stretch and started to cruise. Somewhere near Nelyady a Tata Sumo car filled with passengers braked hard to feed Bananas to the monkeys. This is when my driver lost his cool and got down the bus and gave the sumo driver an earful. Finally the bus made its way to Uppinangadi and stopped for Lunch. After lunch, we resumed our journey and the driver was taking it very slow. He let cars and trucks pass by and was driving very slow. At one point a car carrier overtook us at ease but he seemed not to be bothered. The bus dropped passengers at Bantwal circle, Padil and slowly made its way to Mangalore bus stand. Except for the few incidents on the roads, the journey was very smooth. 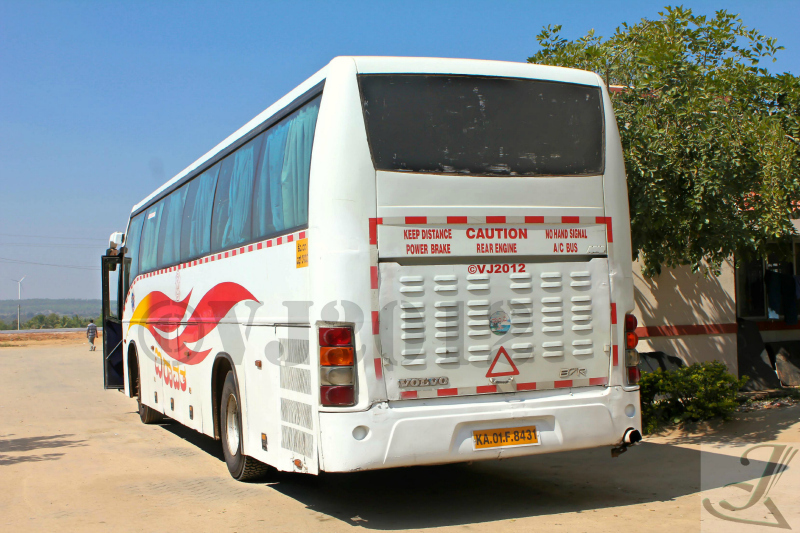 The crew was very courteous and the bus was maintained very well. However I felt we could have reached a little earlier had the driver pushed the bus during the last mile.